Window Cleaning is a commercial window cleaning company with mmany years of experience in the field. We have the ability to offer you a wide range of cleaning services for just about any type of building. When it comes to providing commercial window cleaning services, it is necessary to be equipped with all the necessary equipment and accessories to perform a successful job. As a pro in the window cleaning industry, Window Cleaning is fully equipped with all the right equipment as well as able professionals to handle any cleaning challenge offered by a building of any shape or size. We start a cleaning project only after a full evaluation to determine which method would work best at the lowest possible cost. The quality of the cleaning job is not the only assurance we have to offer. 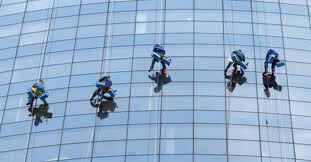 We at Window Cleaning are always concerned about the safety of its employees. We are fully aware of the height related accident statistics. Therefore, when we provide our commercial window cleaning services we carry out a complete evaluation with focus on safety related issues as well as cost and methodology. As quality office window cleaners, our workers come well trained and fully insured against the many hazards of working at extreme heights.